Time to offer up my Carr Skylark that I bought new from Coda Music in Stevenage (it's tax bill time!). A wonderful little amp that couldn't be more perfect for home use with it's built-in attenuator. Looking for £1750 £1600, as that's what the last one went for on here and is a good chunk under retail (they are 2.5k new). Absolutely mint, other than I attached a small mic stand mount underneath the cabinet... the two tiny screw holes are barely perceptible but will be filled (pics asap). Located in Norwich - will post via courier or meet somewhere sensible (let me have your location via PM and we can discuss it). Ooh, I really fancy that. Bloody nice match with your carpet. I can only get to £1400. If we are turning into eBay I can go to £1426.79. 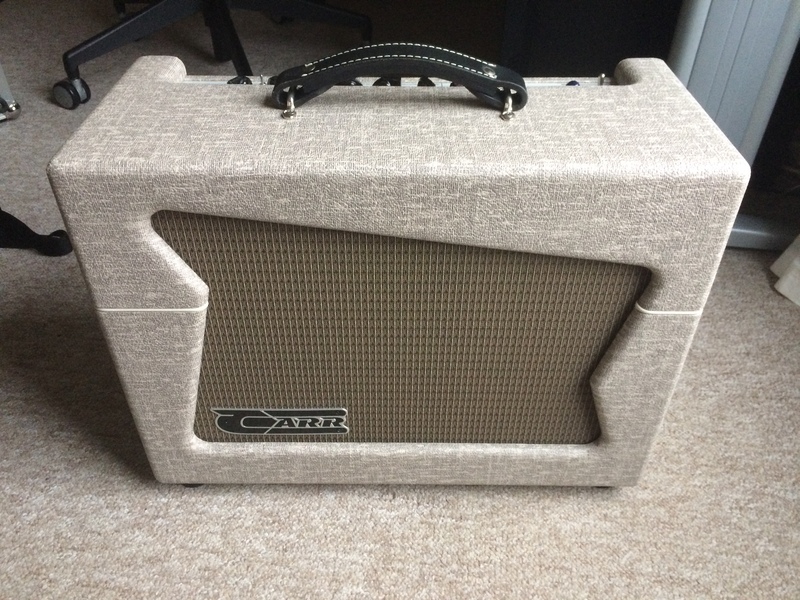 I just love Carr amps, and these are great fun. Superb amp. Yup, just need to convince the missus that we need a vintage tweed carpet next. I might do the bathroom in Friedman tolex. Lovely amp :-). I just sent you a PM for a few more details. Hope that's appropriate - I'm brand new here!